1977. An end to movies as entertainment only. The start of movies, of entertainment, as everyday life? But, I think fewer people consider Mr. Lucas' business genius. I do. 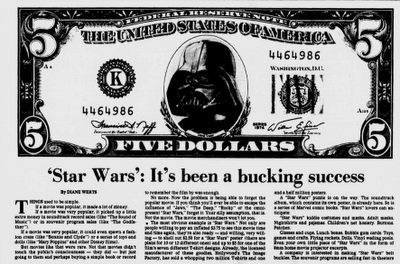 Did you know that he traded writing fees for 40% of the revenue from Star Wars merchandise? And, if you put aside the business aspect... for good, or bad... no matter how you may view it... Star Wars signaled a change: an integration of movies into daily lives. Sure, there were blockbusters before Star Wars... and merchandising... But, to me and my generation, this iconic movie really is a tipping point. A point where movies became daily life for kids... when kids surrounded themselves in Fantasy... in a new world - all sparked by the imagination of George Lucas. Life hasn't been the same ever since.